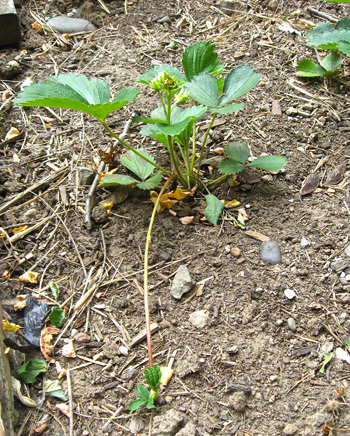 Strawberry propagation is super easy – in fact it happens naturally in each crop. And as the hands-on horticulturist that you are, it’s up to you to make sure it happens efficiently and successfully in your garden! Like all flowering plants, strawberries reproduce sexually through pollination and fertilization. But strawberries also reproduce asexually, by budding new plants that are clones of their parent. They do this via long stems, called stolons, which shoot out a new bud. If the bud is lucky it will take root and a baby bush will grow. But our gardens rely on more than just luck, right?! 1. Find the stolon! It will be an extra long ‘runner’ stem with a small bud at the tip. The teeny bud with baby leaves. 2. Move the stolon off its natural trajectory, and set aside. Dig a shallow groove along the stolon’s natural path. 3. Lay the stolon into the groove and cover with dirt. Only the little bud should stay above ground. 4. Water and fertilize and then let rest. Check up on the plant a week or so later to see that the bud is growing. 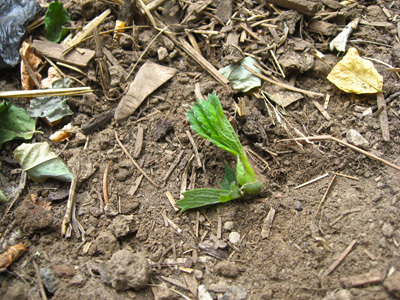 True leaves should be emerging. 5. Eventually you’ll need to check to see that the new plant has taken on roots of its own. I waited 3 or 4 weeks just to be sure. 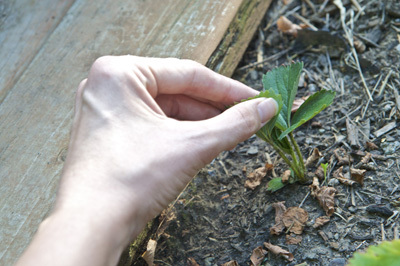 To check that your strawberry is truly independent, grasp the leaves and give a gentle tug. It should stay firmly in the ground. Success! And more strawberries next year! So my strawberry plant only produced like 3 strawberries. Do I need more pollination or something? What am I doing wrong? Do you have any advise when you have too many stolons and your patch is over grown? Is it possible? So we’ve been growing a strawberry patch for about 5 years or so and this year our patch only produced a really really minimal crop and the strawberries it did produce were really tiny. 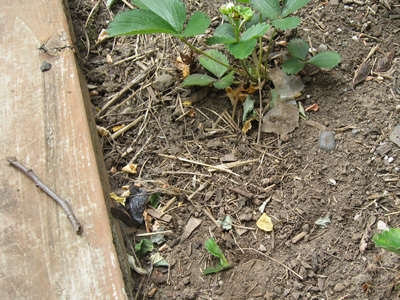 I’m wondering should I just take out the strawberries and compost them and get new plants or would transplanting them in different area help? 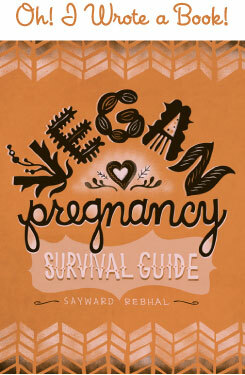 @ Tenise Rae – I’d say low yield is either due to fertilization or age. Strawberry plants produce much less after a few years of age, so could it be that? Otherwise it may just have needed more nutrients or sunlight. Cultivating the runners won’t produce anything this year – they’ll mature next year and you’ll have super young plants which will mean plenty of fruit! @ Farmingthburbs – Yes! Propagate the stolons and tear out the oldest plants. Strawberries decline in yield as they age, so you’ll always want to pull up and toss your oldest (biggest) plants, and always let the stolons take root and grow. This way you’ll always have new, high-yield plants, and you’ll never run out of room. Luck! @ Staar – You should tear out the old ones after the new stolons have established. 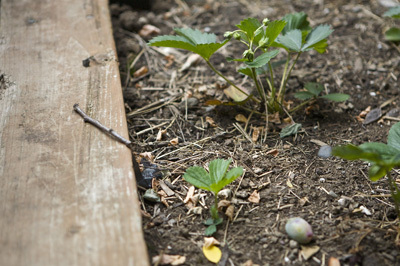 The older plants barely put out any fruit, so tear them out and get them into the compost pile. Leave the brand new ones and you’ll have tons of fresh berries next year! Just rotate them out like that, every few years. Luck! @ Alex – Hmm, haven’t hear that. It makes sense if you’re wanting to produce big fruit earlier in the season. You’d cut off any runners that begin to grow, so that the plant diverts that energy back into making berries, instead of growing runners. Later in the season, when the berries have stopped, I don’t think it would really matter. That’s when I’d let the runners grow and take root. Luck! 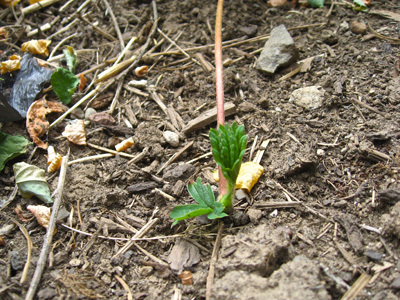 We have always had strawberry plants in our yard, but have you ever tried wild barries? It’s very tiny and looks like strawberry. They are loaded with tons of great vitamins and minerals. And the smell is to die for. Hope you enjoy it. @ Vita – No, I haven’t tried them. I’ll keep on the lookout, thanks! Here are my questions so please remember I am very new to growing these. First, i want to try and grow festival plants here in Pittsburgh for the Summer in a Earthbox. With that said, here goes the questions. 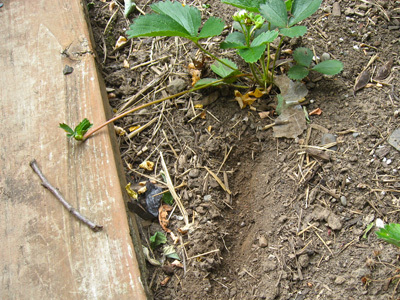 1, How long is a growing season for the strawberry plants? From June~August,Sept? After the Season is over, what happens to the plants? Do I cover them? Discard them? Will they regrow next year? How do I get new plants next year? This is where I am at a loss. Because I do not know if they come up again each year or if you have to replant them each year. With this said, it is going to be quite expensive if I have to order new plants each year. What do I do? ALso, With Pittsburgh weather it is only nice~warm maybe 4`5 months a year them we get the cold front and snow as well. Anyway, Thank you so much for your time in reading and responding. @ Rhonda – Hi, it’s hard for me to comment on your particular climate, a lot of the answers will be specific to your area. If you visit your local nursery I’m sure they’ll be able to help you. 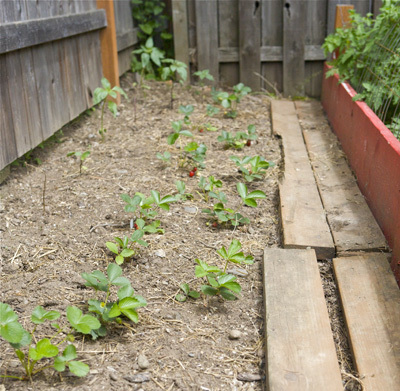 Your strawberries should come back each year but the growing season, how to care for them over winter – all that stuff depends on your area. Luck!